1980: 10 Things You Might Not Know About POPEYE | Warped Factor - Words in the Key of Geek. Geek Dave oughta busk you right in the mush. 1. Popeye was first green-lit in 1977 after Paramount lost out on a bidding war with Columbia Pictures for the screen rights for Annie. 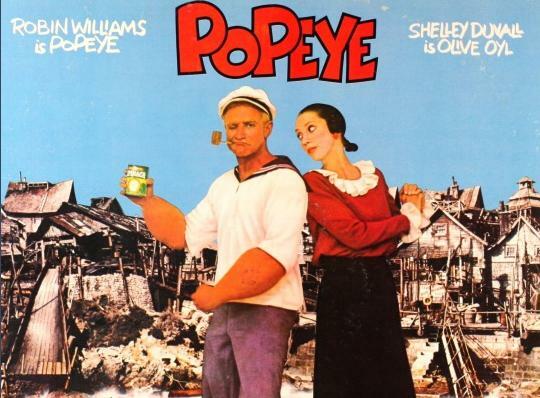 Producer Robert Evans held an executive meeting in which he asked about any comic strip characters they had the rights to which could also be used in order to create a movie musical of a similar vein, and one attendee recommended Popeye. 2. Evans commissioned Jules Feiffer to write a script, and it wasn't long before the first stories surrounding the production began to appear in trade publications. At the time a report claimed that John Schlesinger was attached to direct, and that Evans wanted Dustin Hoffman to play Popeye opposite Lily Tomlin as Olive Oyl. 3. After Schlesinger moved on from the production, and before Robert Altman signed on to direct Popeye, Mike Nichols, Arthur Penn, and Hal Ashby were each attached to film the movie. 4. 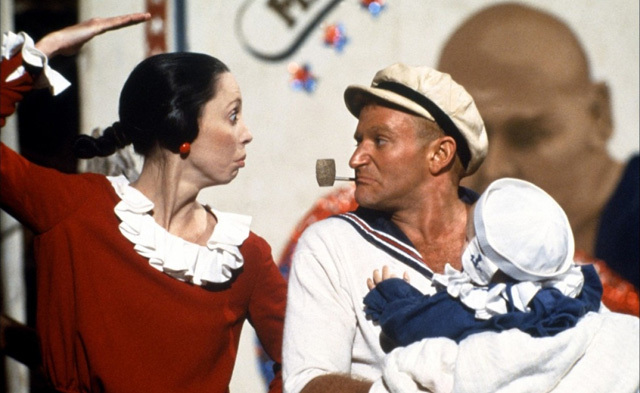 Gilda Radner was now lined up to portray Olive Oyl opposite Robin Williams in his debut big screen role, but after Robert Altman joined the production he was keen to cast Shelley Duvall as Oyl, thinking her perfect for the part. Altman was clearly on to something as Duvall would later reveal that when she was young her nickname was indeed Olive Oyl. 5. In December 1979, Disney joined the film as part of a two-picture co-production deal with Paramount which also included Dragonslayer. Disney acquired the foreign rights through its Buena Vista unit; the deal was motivated by the drawing power that the studio's films had in Europe. Popeye was not only the first joint production between Paramount and the Walt Disney Company, it was also the first time Disney had co-produced a film with another major studio. In the following years, most Disney/Paramount joint productions would involve Disney's Touchstone and Miramax brands rather than the flagship Walt Disney Pictures label. 6. 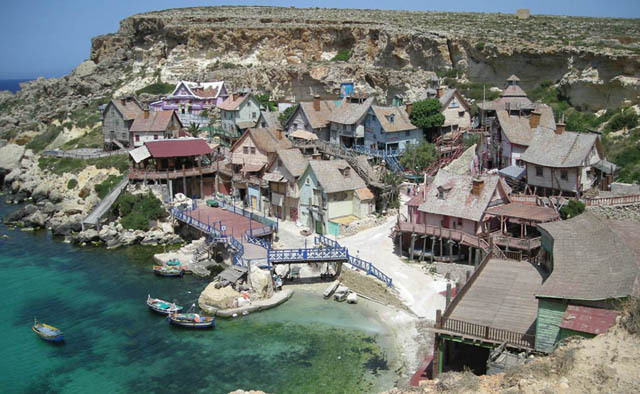 An international construction crew of 165 people worked seven months to construct the set for Popeye at Anchor Bay on the Mediterranean island of Malta. Tree trunk logs were driven across the European continent from the Netherlands, and wood shingles were imported all the way from Canada. Eight tons (7,257 kilograms) of nails and 2,000 gallons (7,571 liters) of paint were used to complete the set. In addition a 250 foot breakwater had to be built in the mouth of the harbor to prevent the set from getting flooded in high seas. When they finished, the fictional village of Sweet Haven consisted of 19 buildings, including a hotel, a schoolhouse, a store, a post office, a church, and a tavern. The set still exists today and is a popular tourist attraction known as Popeye Village. 7. Jules Feiffer's script originally included Popeye's magical pet Eugene the Jeep. Though the Jeep was ultimately left out, Feiffer gave some of its magical characteristics to Swee' Pea, hence the baby's apparent clairvoyance. 8. 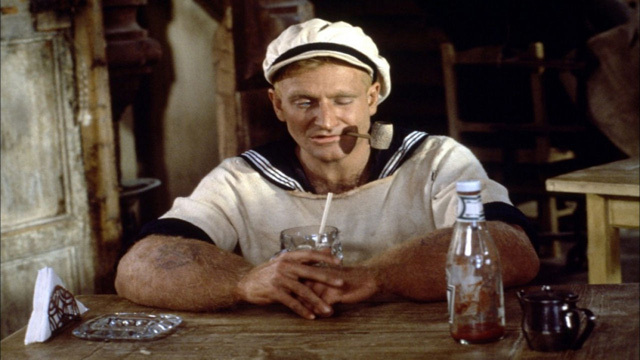 Robin Williams's fake forearms were not ready when filming began, so in early shots Popeye wears a long-sleeved raincoat to hide his normal-sized arms. 9. Jack Mercer, Popeye's most well-known and prolific voice actor, provides the voice of Popeye in the animated introduction. 10. While it may seem odd to most viewers that the movie's portrayal of Popeye does not like spinach, this was a theme that was actually used in the original comic strip by E.C. Segar. Popeye originally boosted his strength by rubbing the hairs on the head of a magical Whiffle Hen called Bernice when he first began appearing in Segar's "Thimble Theatre" in 1929. The consumption of spinach to explain Popeye's strength was introduced in the early 1930s, and was only infrequently referenced until it became a staple of the 1930s animated shorts from Paramount Studios and Fleischer Studios.